"iDevice" and "iOS device" redirect here. For other Apple Inc. devices, see List of Apple Inc. products. This is a list and comparison of devices designed and marketed by Apple Inc. that run a Unix-like operating system named iOS, often colloquially referred to simply as iDevices. The devices include the iPhone multimedia smartphone, the iPod Touch handheld PC which, in design, is similar to the iPhone, but has no cellular radio or other cell phone hardware, and the iPad tablet computer. All three devices function as digital audio and portable media players and Internet clients. 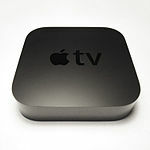 The Apple TV, which ran iOS from the second generation of hardware onward, is a set-top box for streaming media from local sources and from certain internet services to a connected television set, and has no screen of its own. About 1.35 billion iOS devices have been sold worldwide as of March 2015. The operating system on iOS devices can be updated through iTunes, or, on iOS 5 or later, using over-the-air (OTA) updates. A major version of iOS tends to be released every time a new type of iPhone is launched, (usually once a year) with minor changes throughout the year as needed. All updates are free to iOS devices (although iPod Touch users were formerly required to pay for the update). Apple upgrades its products' hardware periodically (approximately yearly). Wi-Fi + cellular models also have a piece of plastic for the cellular antenna. The color of the plastic on an iPad Air or earlier is black; on the iPad Air 2 or later it is black or white. Wi-Fi + cellular models also have a piece of plastic for the cellular antenna. The color of the plastic on the first and second generations of iPad Mini is black; on the iPad Mini 3 it is white. Side view of an original iPhone (right), iPhone 3G/3GS (center), and an iPhone 4 (left). 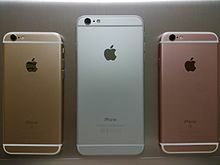 The original is made of aluminum and plastic, the 3G/3GS is made from a hard plastic material, and the iPhone 4 is made of stainless steel and hardened glass. Apple runs tests on pre-production units to determine battery life. However, these are purported maximums ("up to"), and actual user experiences vary. All numbers are in hours unless specified. Apple has increased the storage capacity of its devices over time. Units were or are available with a given storage capacity as indicated. This table indicates the highest supported versions of iOS available for each generation of iOS devices. Beta versions may be listed only if support is discontinued for some older devices. The 3½-inch display introduced with the original iPhone was almost unchanged in all models before 2010. 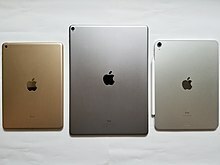 The iPad has a larger display and also uses a different aspect ratio and resolution. The iPhone 4, iPhone 4s, and fourth generation iPod Touch keep the physical dimensions of prior models, but double the resolution in both dimensions, thereby quadrupling the number of pixels in the same amount of space. The iPhone 5 was the first departure from the traditional iPhone and iPod Touch screen size, increasing it from 3.5" to 4", and the resolution was increased to include the extra screen space. The iPhone 6 and iPhone 6 Plus were the second departure from the traditional iPhone and iPod Touch screen size, increasing the screen sizes from 4" to 4.7" and 5.5" respectively, with increased resolution to include the extra screen space.